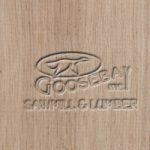 Oak, White - Goosebay Sawmill and Lumber, Inc.
White Oak, generally, can refer to several species. The white oak that we stock is quercus alva which is the principal species. It is heavy, hard, stiff and strong with a hardness rating of 1360. Although old growth oak tends to have a finer grain, the majority of lumber available is sawn from second growth trees. This wood is generally harder and tougher than the old-growth and has a somewhat coarse grain. The sapwood of white oak is nearly white and tends to be narrow. The heartwood is generally grayish brown. The heartwood pores are usually plugged with tyloses, which is the property that makes the heartwood impenetrable to liquids thus making it resistant to decay. White oak machines and glues well. It holds fasteners extremely well. It has a tendency to split when nailed unless it has been pre-drilled. It is used for furniture, flooring, millwork, doors, veneers, and moldings. Industrially it is used for planking and bent parts of ships and boats, as trailer decking, blocking, mine timbers, railroad ties, fence posts, and cooperage. We saw white oak in our mill to be used as trailer decking, blocking, timbers, dump truck sideboards, and in marine applications.